More and more cautious parents are becoming aware of the benefits of GPS tracking for children. Its an obvious need – you never know when you might want to know where your children are. Our GPS tracking for children device offers instant locations via text, or via a user-friendly online website. Sending a text, or clicking “activate GPS” on the website will switch the GPS on – and then within minutes you can get a location. This system keeps the energy usage on the GPS tracker to a minimum, so the battery can last for days. The children’s GPS Tracker also works as a mini mobile phone. 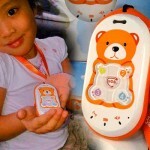 The four buttons on the front can be programmed with specific phone numbers, so by pressing one your child can connect to someone. If you like, you can just program a single number. GPS tracking for children wouldn’t be complete without an SOS button – which all of our trackers have. By pressing the button for a few seconds, the GPS tracker for children sends out an automatic location text to the designated phone number, and also calls the programmed numbers in turn. An added bonus is remote listening – the GPS tracker for children can activate the onboard microphone via a specific text message. There are plenty of situations where these fantastic GPS trackers are incredibly useful. Your child is on a school field trip and you want to know where he or she is. You have a new babysitter and you want to listen in just to make sure that everything is ok.
You have two children – they could both have a GPS tracker and have each others trackers as call numbers – so they can use their trackers as walkie talkies. Your child goes to an after school club and is sometimes late – you want reassurance in case he or she is too late. You’re going shopping in a busy city, and don’t want your child to wander or get lost. GPS Tracking for children is made easy with this great product – click here to read more or to purchase. If you have friends who would find GPS tracking for children useful – please share this page with them using the button below!